Disclaimer: These impressions were based on my initial PS4 playthrough. Playtonic has since addressed some of the issues detailed below and will be releasing a patch in the coming weeks for consoles. A PC-patch has been released as of 6/27/17, however. It’s the summer of 1998 and the boys from across the street want to go to the neighborhood pool. With swim noodles in-hand and goggles dangling from their necks, the two brothers stand over me, impatiently waiting for me to pull myself away from the latest and greatest Nintendo 64 game from Rare, Banjo-Kazooie. “Come on, let’s go! It’s too hot to stay inside!” is what I presume was said that summer afternoon. Their pleas fell on deaf ears, however, as all I could hear were the fine tunes of Grant Kirkhope. A trip to the beach couldn’t even pry my googly-eyes off the screen, because in my head, I was already at the shore, swimming and exploring the coastline of Treasure Trove Cove. If I stare long enough at this manual, maybe I’ll end up back in the 90s. Banjo-Kazooie is one of my favorite games of all time. Rare took what Super Mario 64 established and made it their own. Although nothing compares to Super Mario 64’s near-perfect controls/finesse, the bear & bird’s move-set was new, fresh and innovative. The floating, obstacle course-like worlds from Nintendo’s iconic platformer were traded-in for much more grounded, fully-realized playgrounds. The objectives were unique and varied, the characters were quirky and charming and the game was simply a joy to play… oh, and were there collectables! I have nothing but the fondest memories of Rare’s first 3D-adventure on the N64. To say I was excited for Yooka-Laylee, the spiritual successor to Banjo-Kazooie, would have been an understatement. Kickstarter has been an important, yet risky avenue for both independent studios and veteran developers looking to fund a project. For some individuals, it’s an opportunity to produce a game they couldn’t have made elsewhere. For others, it’s the only channel available to get their project up and running. Rare-alumni Steve Mayles, Chris Sutherland, Gavin Price (and a few other friends) left Microsoft/Rare to form a new studio, Playtonic, in order to develop the game they’ve been wanting to make since Banjo-Tooie. 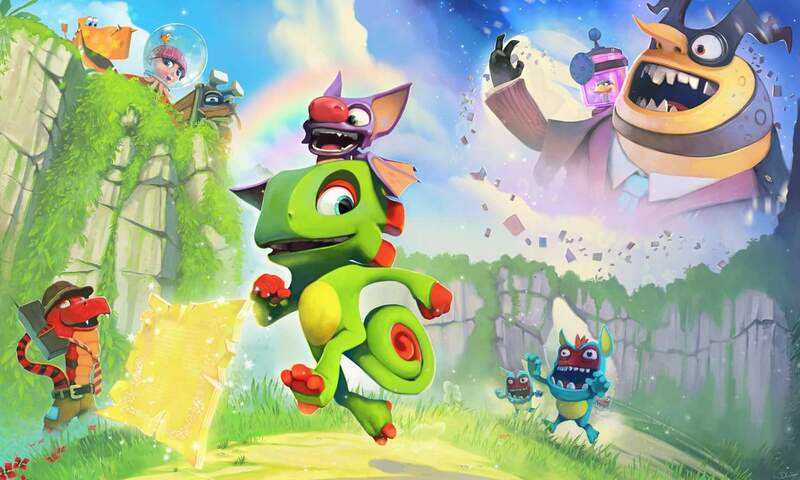 In May of 2015, the Kickstarter for Yooka-Laylee finally launched. This highly anticipated “Rare-vival” became the “Fastest Game to $1 Million on Kickstarter”, according to various sites/outlets. Considering the fact that I pledged a pretty penny myself, I’m not surprised, as the 20/30-somethings with disposable income were chomping-at-the-bits for a proper successor to Banjo-Kazooie and 3D-platformers alike. Big brother bear hanging out with his younger chameleon buddy. Welcome to the family, friend! In a post-Super Mario 64 world, 3D-platformers were very much a thing for us millennials who are still kids-at-heart. For those who didn’t grow-up with the genre, some may write-off Yooka-Laylee as a nostalgia-riddled, cash-grab from the 90s. For most people, anthropomorphic characters running around, collecting widgets & gizmos isn’t the most appealing prospect by today’s standards. However, for people like myself (and many others), Playtonic’s blast-to-the-past embodies a particular era of video games that provided players with hours upon hours of joyful entertainment. While 3D-platformers weren’t typically the epitome of interesting/complicated game design, they focused on simple, yet satisfying “ah-ha…” moments based on exploration, character abilities and, well, collecting stuff. Totals Screens: Both a curse & a blessing for those who are completionists at heart. Transformations in Yooka-Laylee felt more like an afterthought, or rather, an obligation of sorts to Banjo-Kazooie fans who were expecting all the bells and whistles from Rare’s previous affairs. What’s disappointing about the transformations is that while they look nice and animate well, they’re heavily underutilized and at times, function similarly to that of Yooka’s abilities. In Glitterglaze Glacier, for example, the player transforms into a snow-truck in order to plow piles of icy-rocks for a few snowmen who have seemingly lost their hats. Besides the questionable truck-controls, there’s a plant which grants our favorite chameleon the ability to burp-up explosives within the vicinity of the objective. So, why can’t these snow mounds be blown-up with the grenades instead? The truck certainly isn’t “plowing” the snow, so what’s the point of this transformation? As an arm-chair/wannabe designer, I would have approached this objective from a completely different perspective and design philosophy. Instead of slamming into the piles of icy-rocks to uncover the hats, why couldn’t the truck have had the ability to scoop-up the snow instead, you know, like an actual plow? My suggestion would have been to map a plow-like function to the right analog-stick where the player could scoop-up special piles of snow (which could have the consistency of sand, for example, unlike the rock-like “snow” that’s currently present) in order to uncover the missing hats. Pulling back on the right analog-stick would raise the plow (with snow gathered, presumably) and pushing forward on the right analog-stick would dump the snow. This mechanic would have provided the player with a more tactile and rewarding experience, I feel. One of Yooka-Laylee’s defining features is the ability to expand the playable worlds beyond their starting-point. Each world is located within various books, known as Grand Tomes, strewn throughout the hub, Hivory Towers. The main collectable (Pagies) can be used to either unlock new worlds or expand currently unlocked tomes, which gives the player the opportunity to explore and tackle objectives in a non-linear fashion. Upon expanding a tome, the player is greeted with a panorama-view of the world with its newly added sections. It’s certainly a lackluster, uneventful and throwaway sequence. Given their emphasis/fixation on expanding worlds prior to the game’s release, it’s highly disappointing to see the final outcome. While this feature was a novel idea on paper (get it? ), Playtonic’s approach, similarly to how they’ve handled other aspects of the game, felt half-baked, unrealized and compromised. Why didn’t the concept art translate to the final game? This looked so much better conceptually! …has this game actually gone Gold or am I still playing a game in Alpha? Each book also rests on a pedestal and is detailed based on a world’s aesthetic/theme. Tribalstack Tropics is a light-green book, which is representative of the world’s jungle-like environment, for example. The assets/environmental pieces surrounding the book within the hub are also centered around the world’s locale (palm trees surround the Tribalstack Tropics book; the portion of the hub near Glitterglaze Glacier is frozen-over, etc.). Unfortunately, when the book opens, the player is presented with a boring, blank page. A hand-drawn, jungle-setting would have been a nice additional detail, similar to the original concept art (shown above). Also, when Yooka-Laylee jump into the book, there’s a generic placeholder-icon that floats above the player, too. Some of these assets and user interface elements feel like the game’s still in Alpha-state, unfortunately. How did I get here and why? I don’t know, ask the level designer. Finally, the geometry and world structure is both baffling and frustrating. Tribalstack Tropics, for example, consists of a bunch of interconnected islands suspended in the sky. Some cliff-sides and platforms that would presumably be out-of-bounds can actually be traversed if the player finds the means to do so. It’s an incredibly jarring discovery when these unintended areas are located. Furthermore, the worlds that are not floating obstacle-courses sometimes contain sprawling fields of nothingness. The world design is a sloppy, inconsistent mess that leaves much to be desired. Bosses in 3D-platformers have never been a huge focal-point. More specifically, one could argue that the original Banjo-Kazooie didn’t even house them (aside from the final boss, of course). Its sequel, Banjo-Tooie, showcased a few boss-like encounters scattered throughout the worlds which could be tackled in a non-linear fashion (similar to that of Yooka-Laylee). Rare’s own Donkey Kong 64, however, presented them in a more traditional-like manner at the culmination of an area. Were these bosses the epitome of great design? Absolutely not, but they were serviceable and provided an alternative to obtaining each of the game’s primary collectable. Fast forward 15+ years and we’re now playing Yooka-Laylee, the spiritual successor to Banjo-Kazooie and the creative talent responsible for the aforementioned titles. Are the bosses any better or worse than they were back in the N64 days? Banjo-Kazooie’s “bosses”. Hey, they served their purpose. The Great Rampo is the text-book definition of how NOT to design a boss. Rampo requires Yooka to utilize Laylee’s ball-rolling ability in order to traverse a slippery slope. The boss stands firmly on the top of a hill and launches rolling logs down a short & narrow incline. The player’s objective is to utilize the ball-rolling technique in order to climb the hill. Once the player reaches the top of the platform, Rampo begins to breathe fire until his teeth are exposed, which are then to be knocked-out (simply by attacking them) in order to properly damage the boss. This sequence is repeated three times with increasingly difficult log-rolling patterns and additional teeth to bash on each consecutive phase. So, what’s the problem here…? Well, nearly everything! First of all, many users have reported that the ball-rolling technique is far too sensitive. Simply pushing forward on the left analog-stick will launch the chameleon & bat at full-speed. Unfortunately, traversing narrow spaces and making wide turns can become troublesome as a result. While I personally didn’t take issue with the controls, I will admit that this very important maneuver doesn’t feel as tightly tuned/refined as Banjo-Kazooie’s talon-trot. Secondly, the slope that must be traversed is entirely way too short. The platform on which Rampo sits is awkwardly positioned, making the leap from the apex of the hill to the ledge above a challenging prospect. Compounded by the fact that the ball-rolling ability controls quite wildly and you’ve got a recipe for disaster. So, how to fix this? I’m no programmer/designer, but I have nearly 30 years of gaming experience under my belt and I’d like to think I know enough about game design, at least from a player’s perspective. I’m not saying my ideas are the end-all/be-all, either, but given the pedigree behind this game’s development, I expected a whole lot more from Playtonic than what we ultimately received. At the end of the day, a flawed experience can be forgiven when the finer details shine through the crud. While Playtonic clearly had their hearts in the right place, there were a few inconsistent details that drove me up the walls of Mad Monster Mansion, so to speak. Take the Waterworks area, for example. When the player moves from the Archives to the Waterworks, upon entering the Waterworks, the player control is disabled until the camera properly rotates from behind the player’s perspective in order to display the area name and showcase the entrance to the room. This is how all move-locations should operate, in my opinion. Waterworks entrance/exit needs some work. Get it? However, when the player moves from the Waterworks back to the Archives, upon entering the Archives, the player control is NOT disabled, the camera does NOT pan around the character, yet the area name is displayed. Thus, the player begins most rooms while the camera is focused in-front of Yooka-Laylee instead of from behind their shoulders. It’s not game-breaking by any means, but it’s something that stood out to me, more so than the problematic camera controls most people took issue with. It’s difficult for me to allow these inconsistencies to go unacknowledged despite the fact that it’s really a non-issue for most users. Attention to detail and a consistent presentation goes a long way. Grant Kirkhope returned to compose the majority of the soundtrack for Yooka-Laylee, along with industry veteran, David Wise, and Steve Burke. Kirkhope’s contributions were more or less in-line with his previous work on Rare’s titles. His selections for Yooka-Laylee were distinctively Banjo-like; familiar, yet not too risky, but not very memorable, either. A lot of the instrumentation from his previous works were loud and clear and most of his pieces were thematically-driven based on the world’s aesthetic. There were also a handful of nice audio-touches, including ambient changes to the theme while swimming underwater or slight alterations to the music while exploring various indoor/outdoor environments, which is always appreciated. The most unfortunate reality here was how David Wise’s contributions were treated. David Wise is a legend in the business and he’s also one of my personal favorite video game composers of all time. Unfortunately, his tracks were tucked-away in some of the worst “mini-games” that have ever graced the genre. The music alone is great, but good luck attempting to enjoy the wonderful compositions when you’re fighting against the cumbersome mini-game controls and long-winded objectives. Whether this was a joint-decision between the composers or Playtonic’s decision alone, it was a strange and depressing circumstance, nonetheless. In the months since launch we’ve been hard at work on Yooka-Laylee’s first big game update, and we’re pleased to confirm that once our test team is done trying to break it, it will be deploying later this month on PC, followed shortly after on consoles. This rather plump update will add all manner of exciting gubbins, including the optional ability to skip dialogue faster, bypass cutscenes or reduce those pesky gibberish voices (which should please speedrunners), plus a brand new optional camera mode that gives players full control of where it’s pointed. As promised, you can find a detailed breakdown of the updates we’ll be adding in the list below. In addition to these changes, we’ll also have an extensive list of bug fixes – which should resolve most common issues – when the game update is deployed in the coming weeks. The above list is quite impressive, but not shocking by today’s standards. Some may argue that all of these adjustments/bug-fixes/features should have been made prior to the game’s release. While that’s hard to disagree with from a consumer perspective (especially for those who have been here since the NES-days), we’re also not the ones who were waking-up every day, living and breathing a Kickstarter project. To play devil’s advocate, who’s to say games from our childhood wouldn’t have received similar updates/patches if developers/publishers had the means to do so? Older games were certainly not immune to the kinds of problems we see today. Technology, the internet and social media have not only exposed these issues on a larger scale, but they have also given voice to those of us who have historically been unheard. If you’ve gotten this far, you may be asking, “So, what went wrong with this game?”. I’m honestly not sure who’s to blame. It’s sometimes difficult to remove one’s self from nostalgia and some people have trouble judging a game by its own merits, including myself at times. However, there’s so much about Yooka-Laylee that just felt off and it’s disconcerting given Playtonic’s pedigree. Whether this was due to their choice of engine (as Unity has been known to cause problems on consoles), the director, producer, or designers not having a clear, cohesive vision, or the fact that this is, yet again, another Kickstarter project that may have been too ambitious for its own good, it’s difficult to pin-point the who/what/when/where. Every fiber of my being wants this game to do well, however, so Playtonic is given another opportunity to deliver the game I think they wanted to make. Yooka-Laylee is clearly not the “Rare-vival” we’ve been waiting for, but it’s at least a genuine attempt at capturing the essence/spirit of the games that have come before it. Their post-launch commitment is encouraging, to say the least, but their efforts don’t excuse them from how the game initially launched. Despite my disappointment and general frustrations with Yooka-Laylee, something compelled me to keep playing until I saw Playtonic’s adventure to its (unsatisfying) conclusion. Yooka-Laylee isn’t a bad game by any means and it’s certainly playable/beatable (by Kickstarter standards). Was I blinded by nostalgia and felt obligated to finish the game because I invested a large sum? Perhaps it was such a train-wreck that I had to keep playing to see how badly Playtonic missed the mark? Or was the game simply fun at the end of the day despite all of its issue? Is there a check-box where I can select, “…all of the above?”. Regardless, I wish the team the best of luck and here’s hoping Playtonic’s inevitable Tooka-Laylee knocks it out of the park!